Kirby lives on the rainbow islands of Dream Land. The rainbows that connect the islands have been stolen by the evil Dark Matter! Dark Matter has taken control of King Dedede and wants to turn Dream Land into a dark world. With the help of three friends, Kirby sets out on his latest quest to save Dream Land. --From the Gameboy Kirby's Dream Land 2 instruction manual. Play Kirby's Dream Land 2 Now! 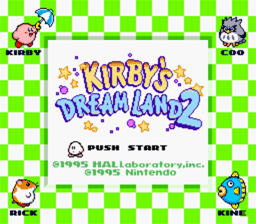 One of the classic Game Boy titles, Kirby's Dream Land 2 will take you into a world of great adventure, and if you haven't played this one back in the 90's, now's the time to give it a try. The graphics are very well sized and detailed, and they look even better when you set the game to Super Game Boy. The classic sounds are all there, from Kirby's vacuum mouth sound to all of the stage's music that has made them so lovable. This is a title recommended for both old and new gamers alike, definitely two thumbs way up! The basic goal of the game is to control the main character, Kirby, and find the way to the star door. Along the way, you'll encounter many different enemies, and that's when Kirby's strengths come in. Some of them will hold abilities that when Kirby inhales and swallows them, he will gain their own. Amongst these are the Parasol, Burning, Needle, Spark, and many others at your disposal. However, if you take damage, Kirby loses the ability and it will begin to bounce around in the form of a star. If you can swallow it back up before it vanishes, you can save the ability if you wish to keep it. Another handy ability of Kirby's is being able to fly. In order to perform this, while in mid air, you press up on the control pad and this will make our hero flap his arms and take to the air. You won't have to go through this fight alone. During some parts of stages, you will encounter mini-bosses whom you must defeat in order to progress. Once you manage that, a bag hanging from the ceiling will drop down and reveal one of your three friends: Rick, Coo, and Kine. Rick the hamster carries Kirby on his shoulders and keeps his traction on ice and doesn't slip. Coo the owl can help Kirby get to the hard-to-reach places and also flies faster than the pink puffball. Kine the fish is most effective in the underwater levels, having a greater swimming ability and inhaling while swimming. Make sure you have the one that's best for you and you may be able to clear a level faster. A handy trick is to use different abilities with different allies, each one has their own technique and can prove quite useful. Once you finish the game with 100%, you unlock a new Option Mode feature. It comes with three sections: Sound, which lets you listen to the in-game music; Boss, which lets you fight all of the bosses in the game with no powers; Bonus, which lets you go through all of the six bonus levels.